I met Gita Vygodskaya in 1995 in Dundee, Scotland through my friend Natalia Gajdamaschko. From Natalia, I knew that she was the daughter of a major Russian psychologist, Lev Vygotsky, who had died in 1934, but whose cultural-historical theory of psychology was increasingly influential in Western universities. It was remarkable that his work - completed from 1924 to 1934 and banned by the Soviet Union soon after his death -- was thriving more than fifty years after it was completed. Natalia, a Vygotskian, had studied neuropsychology at the school created by Alexander Luria -- one of Vygotsky’s closest colleagues -- located at Moscow State University. She had come to Dundee for a conference and was excited to meet Gita. They became good friends and met many times during the following fifteen years. 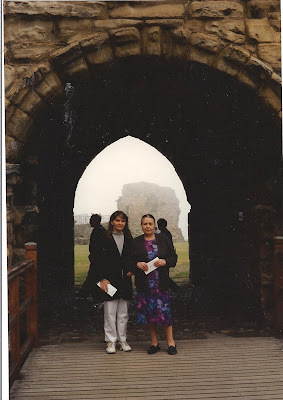 I was a bystander in Scotland for a vacation, but I had a rental car and Natalia enlisted me to drive her, her son Dennis, Gita, and a couple other folks to see some of the area. We went to nearby St. Andrews for a visit. It was a delight to find that Gita was a warm, engaging person who had formed a nice bond with Natalia and Dennis. We spent a pleasant day seeing the sites of this historic city. I spent some more time with Gita and her daughter, Elena Kravtsova, in 1997 when they came to Athens, Georgia as distinguished lecturers at the University of Georgia. By that time, I had learned more about Vygotsky’s life and about Gita. For example, I knew that, though it was very dangerous, her mother had kept over 200 of Vygotsky’s manuscripts in their small apartment after his death. When her mother died, Gita took over stewardship of the writings and kept them safe during the war years and the difficult years that followed. Maintaining this trove of papers could have had dire consequences for Gita and her family had they been caught with them. Restrictions on publishing and reading Vygotsky’s work lessened in the 1950s after the death of Stalin. A collection of Vygotsky's papers was published there in 1956, reflecting an easing of the Communist Party's negative view of Vygotsky's theories. This book was translated into English and published in the United States with the title, Mind and Society, introducing the full scope of Vygotsky's work to the West for the first time. The revival of Vygotsky's theories was accelerated in the 1980s when several of his former students, with Gita's help, prepared a six-volume collection of his work, published between 1983 and 1987. Included in this volume were many unpublished manuscripts that survived because Gita, her mother, and her sister had made sacrifices necessary to preserve them. While assisting with the publication of her father’s collected work in the 1980s, Gita also carried out her own research on his life and contributions. Her book, Lev Semenovich Vygotsky. Life. Work. Brush Strokes of the Portrait was published in 1996 in Russian. Parts of it have been translated into English and published in the Journal of Russian and East European Psychology. With the liberalization, and then, the end of the Soviet Union, Gita began to receive invitations from throughout the world to take part in conferences that were devoted, at least in part, to her father's psychological theories. Also, the Vygotsky Institute for Psychology was created at the Russian State University for the Humanities in Moscow by Elena Kravtsova, who still heads it, and the Institute began to hold annual meetings on Vygotskian psychology in Moscow. The meetings are attended by scholars from throughout the world. Gita was usually a star attraction at these meetings. In her 1997 lecture at the University of Georgia, Gita talked mostly of the intellectual and personal history of her father. She was only 9 when he died in 1934 at the age of 37. Nevertheless, her memories of him were vivid, warm, and loving -- and often humorous. She recalled her father’s vibrant intellect and devotion to science, and how she and her sister were sometimes the subjects of his experiments and observation. For example, they were enticed to traverse mazes, with an orange as their reward for successfully completing it. At other times, their father just talked to them to get their reactions to certain situations -- to see how they, as children, thought about different puzzles and problems. Gita Lvovna Vygodskaya about her father, Lev Vygotsky from Natalia Gajdamaschko on Vimeo. Gita also talked about the lively intellectual life at the Vygotsky apartment, one big room, that served as both home and office. She recalled frequent meetings there of Vygotsky's students and distinguished colleagues, such as neuropsychologist Alexander Luria and Alexi Leont’ev, who became famous names in the discipline. The most vivid part of her talk at UGA was about her personal recollections of her conversations with her father. These vignettes humanized him and grounded his work. She told a touching story of how, when she entered the first grade, her father had cleared the left corner of his desk for her to use to do her school work. While the UGA lecture was helpful in understanding more about Lev Vygotsky, it also increased my curiosity about Gita’s life. What was it like growing up the daughter of Vygotsky in the late 30s and 40s. What did she see and hear as a child during the frightening years of the Great Terror. How did she live as a teenager during the terrible war years? How were she and her family treated by former friends and colleagues of her father after his writings were banned. What threat did they feel from the government, how did they cope with their fears? What was her view of Stalin and his successors? How did she get into Moscow State University? These and other questions arose as I heard her speak. Unfortunately, she did not talk too much about herself and what happened after her father died. She did note that she had loaned some of Vygotsky’s writings, at some danger, to friends during the time his work was banned. Also, she spoke of the fifties as a time when it still was not safe to say the name of her father. I hope that a biography of Gita will someday be published to provide a fuller picture of her life and the context within which it was lived. Gita’s 1997 visit to Georgia was another enjoyable encounter with history and an opportunity to learn more about her father. Natalia and I had a reception for Gita and Elena at my house, and they volunteered to help cook some of the Russian dishes that were served. They were a pleasure to have as guests. It was clear that Gita, a most pleasant and down-to-earth person, was enjoying her chance to see a new part of the world. I had opportunities to see her and Leona again in Moscow; once, Natalia and I were invited for a dinner at their sprawling Moscow apartment (they later moved to another place on the outskirts of the city). The last time I saw her was at a Vygotsky Institute of Psychology conference in Moscow. She was then, as always, friendly, kind, and thoughtful. Natalia visited Gita and Elena periodically in Moscow and maintained contact with both by telephone. She was distressed to hear from Elena of Gita's worsening health through the 2000’s. Gita’s family, her many friends, and others, like me, who knew and admired her from a distance, were saddened when Gita died in July 13, 2010. She was 85. I remember Gita as a person of dignity and warmth, who showed deep interest in others. I am also sure that she had great inner strength, tempered by the hard times in which she lived most her life, and had tremendous courage, evidenced by her success in protecting the legacy of her father. Without her, so much of his work could have been lost and so much of his life remained unknown. She was a good, loving daughter who helped to reveal the genius of her father to the world while living her own productive and interesting life.